I came across this book while browsing Amazon.com. They had slyly included it as one of their “recommendations” for me and I couldn’t help but click the link to find out more. 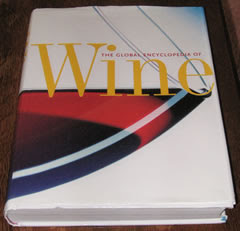 The Global Encyclopedia of Wine is a massive work: 912 pages, 6.2 pounds (according to my digital scale), with 36 contributors whose contributions were coordinated by the editor, Peter Forrestal. Unlike Jancis Robinson’s Oxford Companion to Wine, which is arranged like a dictionary with its alphabetical listings, the bulk of the Global Encyclopedia takes us on a wine tour of the entire globe with separate chapters for each country or area, broken into subchapters for the regions within those areas. The first 60 pages of the book are an introduction to wine: the history, wine trade, the different types of grapes, how wine is made, and aspects of enjoying wine such as how to taste and evaluate them. The remainder of the book is devoted to sections by country or area and appears to leave no stone unturned. Very nice color photography graces almost every page in the book, as well. I have only been able to read a small fraction so far, but the chapters appear to be well-written. Being pretty much a layman, I am going more by what is included in the book rather than what is not there but it seems to me that this is a fairly comprehensive work for those interested in wine on a global level. Each country chapter discusses the viticultural history of the area, its principal grapes, and features selected domains. Some of the domains are obvious choices due to their size or reputation but others are less obvious. I have to mark down the book because there is no mention of Twisted Oak Winery anywhere! Or El Jefe, for that matter. Robert Parker is mentioned only once, on page 666 (?) 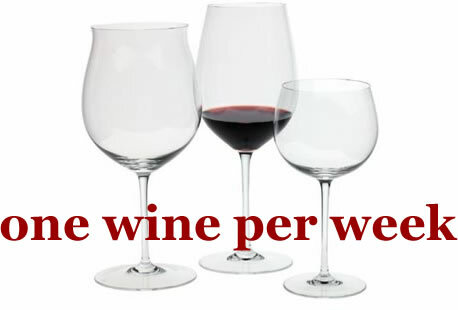 and not with respect to the Wine Advocate but instead as being part owner of Beaux Freres Winery in Oregon. This book would nicely complement Jancis Robinson’s Oxford Companion to Wine. It takes a different approach going country-by-country and my feeling is that it is more for pleasure reading rather than a reference work. Having both of these volumes would not only have the potential of giving someone a hernia, but it would also provide a lot of reference material for whatever wine query one might have. This isn't a new book and perhaps you've already heard of it. I had never heard of it myself and seeing as it is fairly recent (2001) I thought those of you who weren't aware of it might be interested. Price: This book was originally published by the Wine Appreciation Guild in 2001 and is available from Amazon.com for $54.75, discounted from the retail price of $75.00. However, there are used and new copies from other vendors available from the Amazon Marketplace starting at $18.66. Even better, the book has been reprinted as one of those deals that gets sold to book warehouse and overstock places and this version, the exact same thing as the original except it doesn’t contain a supplemental CD, can be had for as little as $5.40. I paid $9.99 for mine because I chose a seller who had very high customer satisfaction scores. I figure I don't need a CD. I don’t think I would pay $54.75 for this book (cheapskate that I am, although it is nice), but it definitely has great QPR at the prices listed in the Amazon Marketplace. It’s got attractive photography and gives pretty good coverage of wine around the world.